Jets' fourth line a smart combo - The Point Data-driven hockey storytelling that gets right to the point. One of the players I was most looking forward to watching on the Winnipeg Jets this year was Jack Roslovic. As a rookie last season who played just 31 games, he scored at nearly a half point per game pace in limited minutes and created scoring chances against fairly managed competition at a first line rate at 5-vs-5. Doing that as a rookie centre at just 21-years-old was really impressive, and I see him as a huge part of the future core of the Jets, an important, cost-controlled piece for a team that should be a Stanley Cup contender for a long while. Unfortunately, Roslovic didn’t have the greatest start to the season, putting up just two assists in his first 14 games, and being exploited defensively fairly consistently. A similar story has afflicted a veteran to start the season, at least offensively, in Mathieu Perreault. Perreault has long been an underrated play driver in the NHL, who keeps his team on the right side of the puck when he’s on the ice, and chips in with about 40 points per season despite usually missing some time due to injury. Last year was no different for Perreault, who produced solid second line numbers with 17 goals and 39 points in 70 games, but to start this season he’s stuck at just three goals and four points. 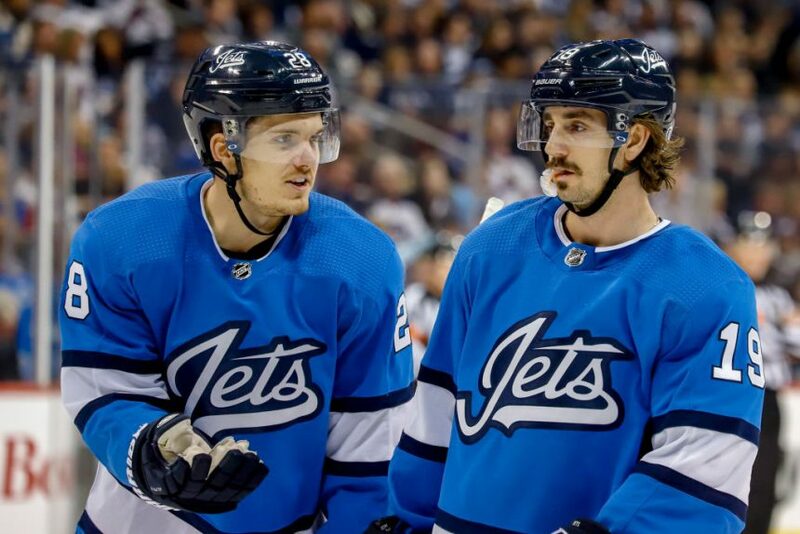 While juggling his lines, Paul Maurice decided to put the two struggling offensive players together with Nic Petan, who has played well in the American Hockey League for years but struggled to stay in the NHL with the Jets, and it appears that he’s found something there, which we can see by looking at each player’s statistics before they were united as a line, and after. Petan’s sample size before the line was put together was minuscule at just 12 minutes, so I wouldn’t put much value in him not being on the ice for a high danger scoring chance against, but the main thing to notice is that Roslovic has gone from being outplayed quite severely in every category except for passes to the slot, to the Jets outplaying their opponents while he’s on the ice by a massive margin. 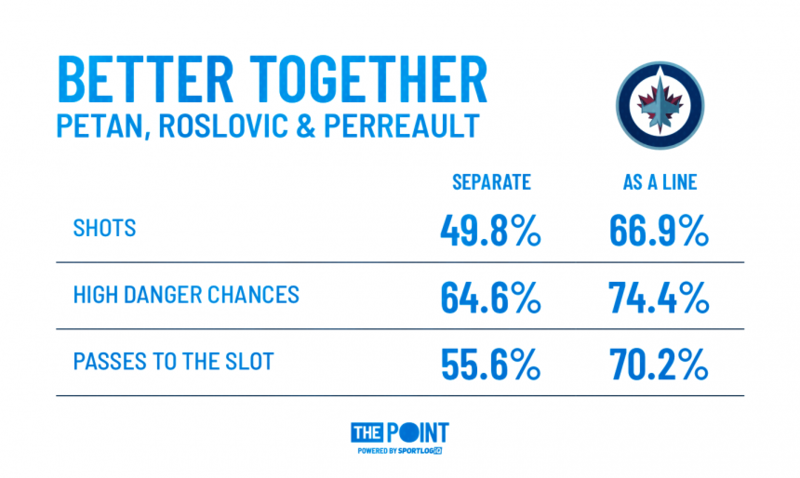 Perreault, whose underlying numbers are almost always strong, has gone from already good to even better, with a big improvement in his pass to the slot numbers, with both his offensive and defensive contributions being much stronger in that area. Petan meanwhile, just looks excellent at 5-vs-5 across the board with this line, despite not producing any points. When you break down how each of these forwards play the game, it makes sense that they have chemistry; with Roslovic being a playmaker primarily, involved in creating over eight scoring chances per 20 minutes while this line has been together, a top line rate in the NHL, while Perreault is great at getting into the tough areas on the ice despite being undersized, producing lots of high danger chances that Roslovic set up. Meanwhile Petan likes to set up in the high slot, and in fact, only Patrik Laine and Mark Scheifele have produced chances from there at a higher rate than he has since this line was put together. Moving the puck to the slot has been the name of the game for this line, completing a combined 5.03 passes to the slot every 20 minutes, behind only the Jets’ top line, who create an absolutely absurd 6.37, one of the best marks in the entire NHL. That level of pre-shot movement from a fourth line is a huge asset for Winnipeg, and considering they have Perreault there to keep things relatively composed, they’re not a line that necessarily needs to be very sheltered, though they likely will be considering the strength of the Jets’ other lines, not to mention the uniquely strong grinding line of Adam Lowry, Brandon Tanev, and Andrew Copp. Considering this line has played just 40 minutes together, we’re probably getting a little carried away here in digging into all the data, but things like shot attempt differentials give us an idea of what the line can do long-term, and it doesn’t hurt that by every measure this line comes out looking good. Whether they can sustain this level of play long enough to get all three of these players really going offensively is up for debate, but right now it appears to be a very smart combination.